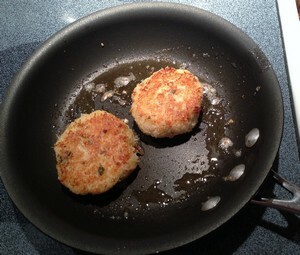 Making crab cakes is a lot like making hamburgers: take a protein, add some binder and seasonings, shape into a patty and cook. You can use this technique for any type of seafood cakes. The Accidental Locavore got a surprise shipment of beautiful crabmeat from Maine, and promptly put most of it to good use. This made 8 crab cakes, about 2” in diameter. In a medium sauté pan, heat the oil over medium heat. Add the onions and cook until soft and translucent. In a shallow bowl, put about ½ cup of panko for coating the cakes. Set aside. While the onions are cooking put the crabmeat, mayo, breadcrumbs, red pepper, thyme, salt and pepper into a medium bowl. When the onions are cooked, add them to the bowl. Mix until all the ingredients are well incorporated (since I’m going to use my hands to make the cakes, I usually end up mixing everything with my hands too). 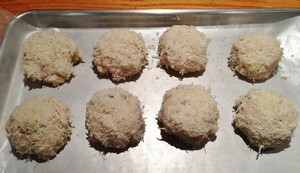 Form the mixture into patties and lightly coat them with the breadcrumbs in the shallow bowl. Place the finished cakes on a sheet of waxed paper. 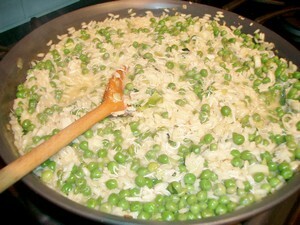 To cook them, put 2 tablespoons butter in a medium-large sauté pan over medium-high heat. Add the cakes and cook for about 5 minutes, until golden brown. Turn them over and cook for about another 4-5 minutes, until golden brown. Serve with lemon and Tabasco and enjoy! Notes: I usually make the patties about 2” but feel free to make them larger and serve them in a toasted roll, like a crab-burger or make them tiny and serve as hors d’oeuvres. Some people like celery minced into their crab cakes, I’m not one of them. The thyme adds a nice note, but it’s not essential, same for the red pepper flakes. You could also substitute a beaten egg for the mayo.